Light and sound brainwave frequency stimulation opens a door to your mind that is full of realizations about oneself, plastered all over that inner-chalkboard of our consciousness. Sure we externally hear about things we NEED to change until we just tune them out. But we hear in our minds that it is time to change before whatever it is to happen happens. You must WANT change to happen. You must really want to stop your addiction or hitting rock bottom looms closer. Regular use of light and sound stimulation offers you continued inner-realization and acceptance of your desired WANT with improved self-generated motivation and positive inner-reinforcement as benefits. Before embarking on your personal journey of using the Delight Pro, write down what you want to achieve, like your goals and why they are important to you. Create a simple plan for realizing these goals. Remember: baby steps. Do not make things difficult; do not create goals that are unrealistic. Keep things simple! And keep what you have written close to your mind machine. It is a good idea to make a copy of what you have written and keep it in your wallet or purse and refer to it when you feel the need to review it. I did. It acts like a booster; a reminder of what is important to you when doing a light and sound session is unavailable. The DAVID Delight Pro by Mind Alive is the leading light and sound mind machine available for accessing all four general brainwave states: Beta, Alpha, Theta and Delta for the promotion of improved mental, emotional and physical performance including sessions targeting beneficial R.E.M. sleep. Your thoughts dissipate, your body relaxes, and you awake refreshed. 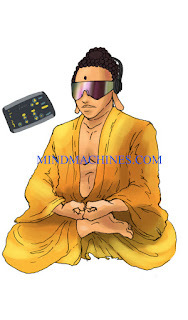 The DAVID Delight Pro is the most effective and beneficial light and sound mind machine made. When doing a session, keep the brightness of the lights low with your eyes closed. The more you experience sessions, your eyes will build tolerance to the brightness and you may increase the intensity. But always keep the brightness at a comfortable level. Brighter is not better or more effective. The same applies to the audio volume. Keep the sound of the pulsed audio beats just below the threshold of your hearing. Just like the light intensity, audio volume at a low, comfortable level is best. Having the volume set high does not make it any better or any more effective. For a complete understanding of how best to use a mind machine and to learn how to maximize your session experiences, read the easy-to-understand ebook Mind States / An Introduction to Light & Sound Technology. The last chapter of Mind States contains a 30-Day Journal for you to write down your reactions to the sessions you have just listened to. It is of immense value for looking back and seeing the changes that have been occurring to you as you progress from day one to receiving your 30, 60, even 90 Day chip. You should be amazed at the subtle changes that have occurred to your mental, emotional and physical states of being. Listen to the Delight Pro sessions and your recovery could be much less anxious and more like focused and relaxed.